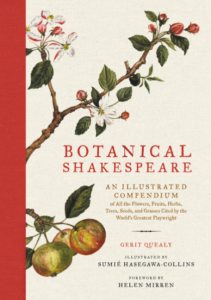 Botanical Shakespeare opens with a brief look at the Bard’s relationship to the plants mentioned in his works—a diversity that illuminates his knowledge of the science of botany, as well as the colloquy, revealing his unmatched skill for creating metaphorical connections and interweaving substantive philosophy. At the heart of the book are “portraits” of the over 170 flowers, fruits, grains, grasses, trees, herbs, seeds and vegetables that Shakespeare mentions in his plays and poems. Botanical Shakespeare features a gorgeous color illustration of each, giving a “face” to the name, alongside the specific text in which it appears and the character(s) who utter the lines in which it is mentioned.